Seems like the festive spirit is just around the corner. Celebrate with us at this winter’s most enchanting setting in the capital! A hidden gem in Fitzrovia, The Elysée is London’s original Greek restaurant. Offering an exhilarating live music programme, our versatile venue comes with different choices for you. 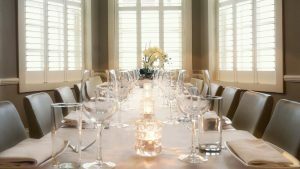 Private Dining at the First floor, hosting private and social parties all year round. Beside that, a chic Cocktail Bar & Lounge comes along with a lovely Roof Garden. It is no question we are the ideal setting for this year’s Christmas celebrations. Above all, our traditional live Greek music & entertainment warms up the festive spirit 6 days a week and our Cocktail Bar spices up midday or evening festivities. Therefore, join us for an unforgettable experience this Christmas!